InterCoastal Net Designs has been partnering with Coldwell Banker Sloane Realty for many years for website development, MLS Integration and Internet Marketing. We also work with their vacation rental branch, Sloane Vacations, for their Booking Engine Integration and internet marketing. 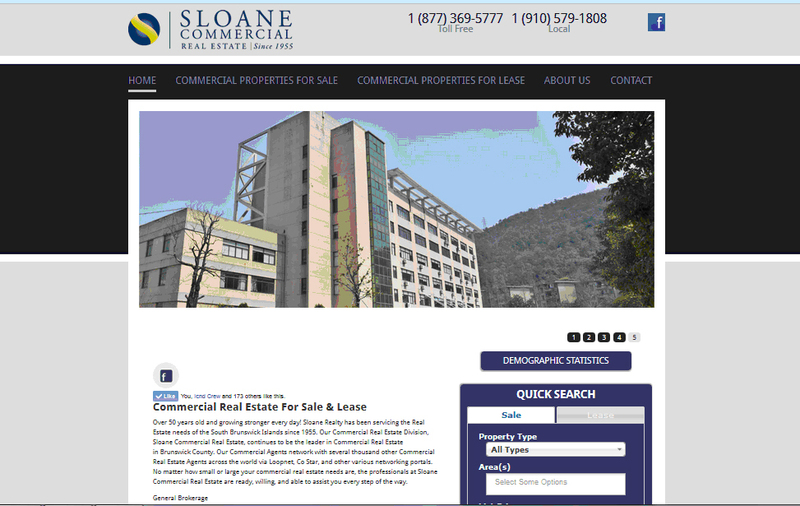 We have recently launched a third site for their commercial real estate division. When we first discussed the project, the BIC informed us that the commercial properties that they would like to advertise were not necessarily in the MLS. So instead of integrating with the Brunswick County MLS as on their sales site, we opted to provided them with a panel where they could manually enter all of their commercial properties for lease and for sale. On the new commercial website you can search for properties by price range, square footage and more. We took the look and feel from the residential sales site, and manipulated it to be more commercial relevant. This site is a great solution for businesses in Brunswick County looking for a commercial location to rent or purchase!